Before launching our journey to South East Asia in the footprints of Rama, we must mention that Valmiki, according to historians lived anywhere between 800 BC and 400 BC, composed Ramayana based on the oral traditions that were a thousand years older. In India, apart from at least four more Ramayanas in Sanskrit, there are the Jain Paumachariyam in Prakrit, Ramcharit Manas by Tulsi Das in Hindi, Sundarananda Ramayana and Adarsha Raghava in Nepali, Katha Ramayana in Assamese, Krittivas Ramayan in Bengali, Jagamohan Ramayana in Oriya, Rama Balalika in Gujarati, Ramavatar in Punjabi, Ramavatara Charita in Kashmiri, besides the well known Kamba Ramayanam in Tamil, Ramacharitam in Malayalam, Ranganatha Ramayanam in Telugu and Torave Ramayana in Kannada. We travelled across South East Asia as co-researchers to evolve the script and also to plan the shooting. If conceptualising that into a television format was a major challenge, the nitty-gritty of organisation crisscrossing over a hundred locations in five countries was no less difficult. During our subsequent visits, we had distinct, but equally heavy responsibilities to perform â€” Mohana as the producer taking on the burden of dealing with two monarchies (Thailand and Cambodia), two Communist countries (Vietnam and Laos) and one democracy (Indonesia); while I began to write and direct the serial. In all these travels, the name â€œRamaâ€ kept emerging everywhere. One of the most important landmarks of the Indonesian capital, Jakarta, is a gigantic modern sculpture, an extraordinary work of art of Krishna and Arjuna in the chariot with their horses almost flying. Garuda is the national insignia of Indonesia. If you move on to the predominantly Hindu territory of Bali in Indonesia, which has a few thousand Hindu temples, you see the strong influence of Ramayana in the sculptures and performing arts there. We see two group dance performances of the Ramayana â€” one on a modern stage, and the other in a spiritually devout atmosphere of a temple, where some dancers are in a trance. Rama lives in their midst with no questions being asked. Leaving the 17,000 islands of Indonesia, we travel to mainland South East Asia. The Laotian version of Ramayana, called â€œPalak Palang,â€ is the most favourite theme of the dancers of Laos. The National School for Music and Dance, in this communist country, teaches the Ramayana ballet in the Laotian style. Several Buddhist monasteries and stupas of Laos have sculptures depicting Ramayana in stone as well as in wood panels. There is a perceptible Hindu-Buddhist syncretism in that entire region. There are sculptures of Rama and Krishna and other avatars (incarnations) of Vishnu in the Shiva temple at Wat Phu Champasak in southern Laos, which has been declared a World Heritage Centre by UNESCO. Ramayana is immensely popular in Thailand. Huge statues of Sugriva and other characters from Ramayana decorate the courtyard of the Royal palace, surrounded by huge corridors depicting the whole story of Ramayana in large paintings from floor to ceiling. Ramayana sculptures adorn the walls and balustrades of several other Buddhist temples in Thailand. In the Thai version of Ramayana called Ramakian, rediscovered and re-composed by the Thai King, Rama I in the 18th Century, Hanuman is a powerful figure. We also visited several areas where Hanuman is worshipped. 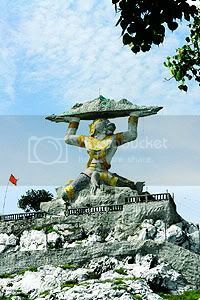 There is a huge statue of Hanuman on a hillock facing a major Buddhist monastery. Several kings of the royal family of Thailand (including the present king) adopted the name â€˜Ramaâ€™, over the last three centuries. Before the capital was shifted to Bangkok, the capital of Thailand (then Siam) was called Ayuthya (Ayodhya) as a mark of respect to Rama. In Vietnam, a nation predominantly under the ancient Chinese influence, we see Rama and Krishna, although there is no local version of the Ramayana. In central Vietnam, which was known as the Hindu kingdom of Champa for over 1500 years, there are a large number of Hindu temples, some of them have an unbroken tradition of worship, dating back to a thousand years. You find Rama as an incidental presence in the temples that are predominantly dedicated to Shiva or Uma Maheswari. There is a lot of Krishna in Champa. If any country in historic times had matched India in its faith in Hinduism, it was perhaps Cambodia. In this war torn Buddhist monarchy, which has met many tragedies in recent times, you find that coronation is complete only with the handing over of ancient gold idols of Shiva and Vishnu by the rajaguru to the king. More than a hundred temples, mostly in a state of ruin, tell the story of the great empire of the Khmers, who worshipped Shiva, Vishnu, Brahma and the Buddha. It is here in Cambodia that Suryavarman built his truly colossal temple dedicated to Vishnu â€” Angkor Wat, believed by million of visitors, to be most worthy of being included in the Seven Wonders of the world. Angkor Wat, the largest stone temple for any deity in the world, has a nearly 2.7 km circumambulatory passage with gigantic carvings devoted to the epic stories of the churning of the ocean, Ramayana, Mahabharata and so on. Having born into the Raghvansh clan , I am supposedly a descendent of Rama. The deep curiosity led to decades of researches about his origins. That included dwelling into the written texts and the various versions. The killing of Bali on a muddy shore is the recounting of an ice age civilization in sub arctic that used to kill whales. But,however strange it may sound , it also recounts the murder of Pompey on the Egyptian shore where he had gone to seek asylum after losing to Julious in the Roman civil war. Hanuman in these passages is Cicero. In the older contex he recalls the memorary of a people who had made great strides in linguistic expressions. Incidently the original Ramsetu was the Baring Bridge.